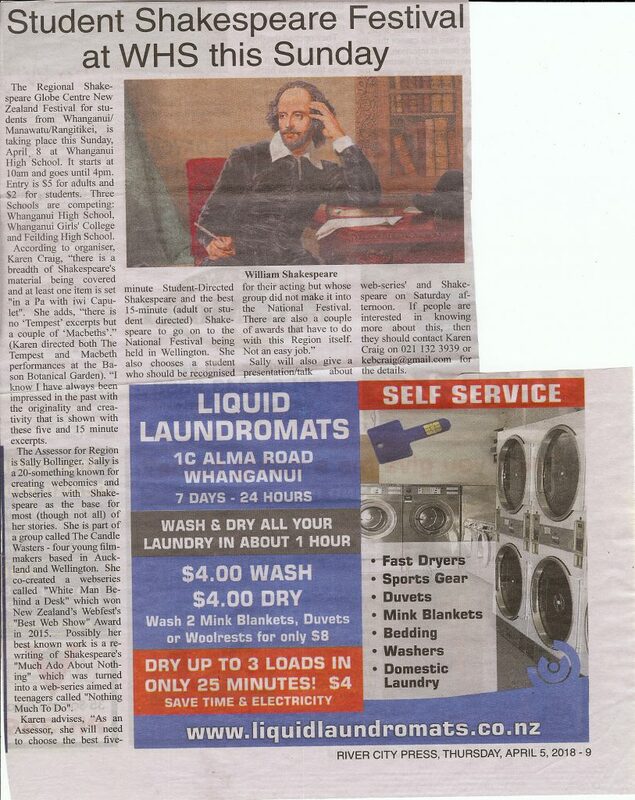 Mastering the art of performance, dealing with nerves, being competitive and learning the beauty of Shakespeare were all part of the challenge for high school students battling for the title of regional winner of the Shelia Winn Shakespeare competition at the weekend. 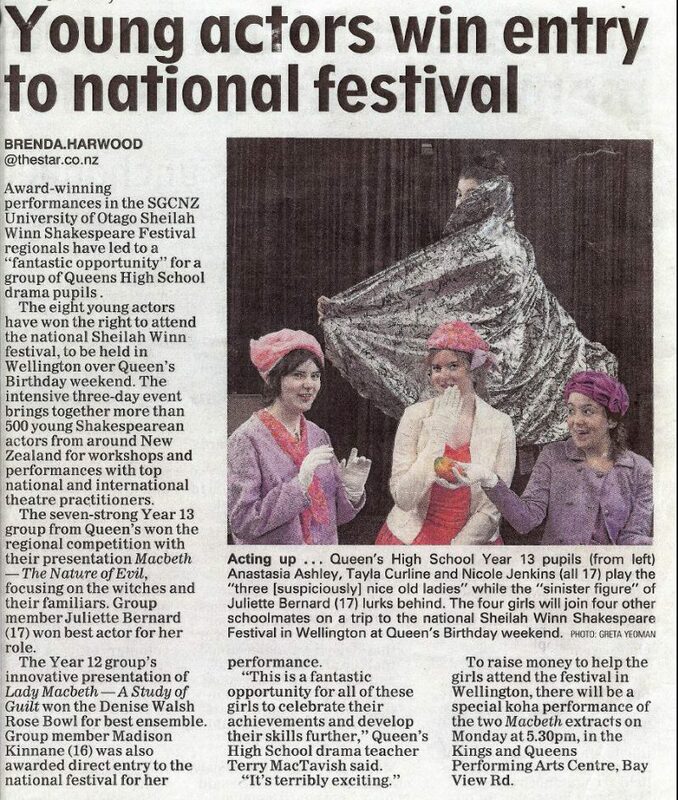 Nine groups took to the stage at Rotorua Lakes High School on Saturday. One Western Heights High School group chose a 15-minute excerpt from act one, scene one of Much Ado About Nothing. 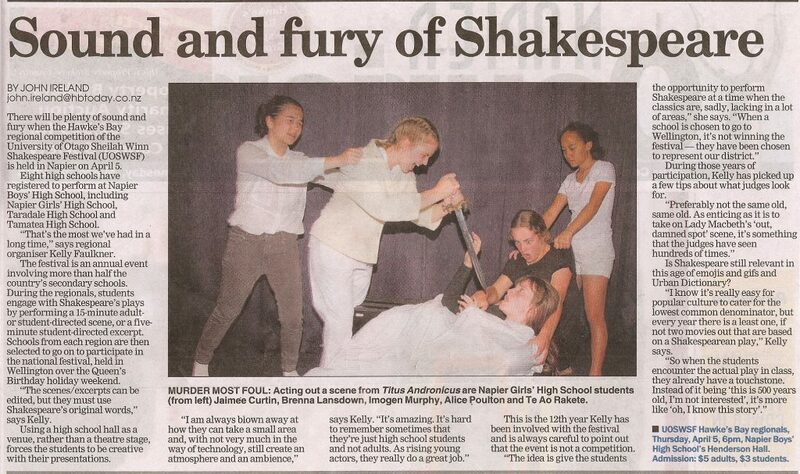 Teacher Keely Bell had an interest in Shakespeare and decided to direct the scene. The scene centres around Beatrice as the young woman of the house. A group of men are staying after their time in the war, but friends and foes are reunited and sparks threaten to fly. The Shelia Winn Shakespeare competition is designed to encourage critical thought, historical curiosity, an exploration of human behaviour and a love of literature and language. The winner of the regional competition will travel to Wellington for the national competition but Bell said it was less about the competition for her group. 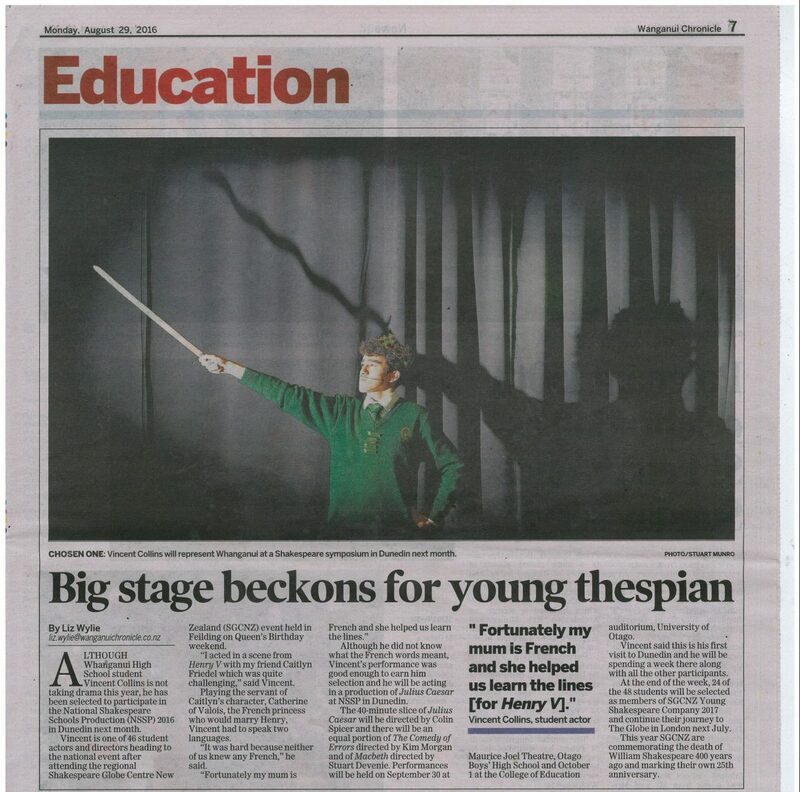 Year 13 student Tamahou Smith played the witty and charismatic character of Benedict and hopes one day to grace our television screens as an actor. 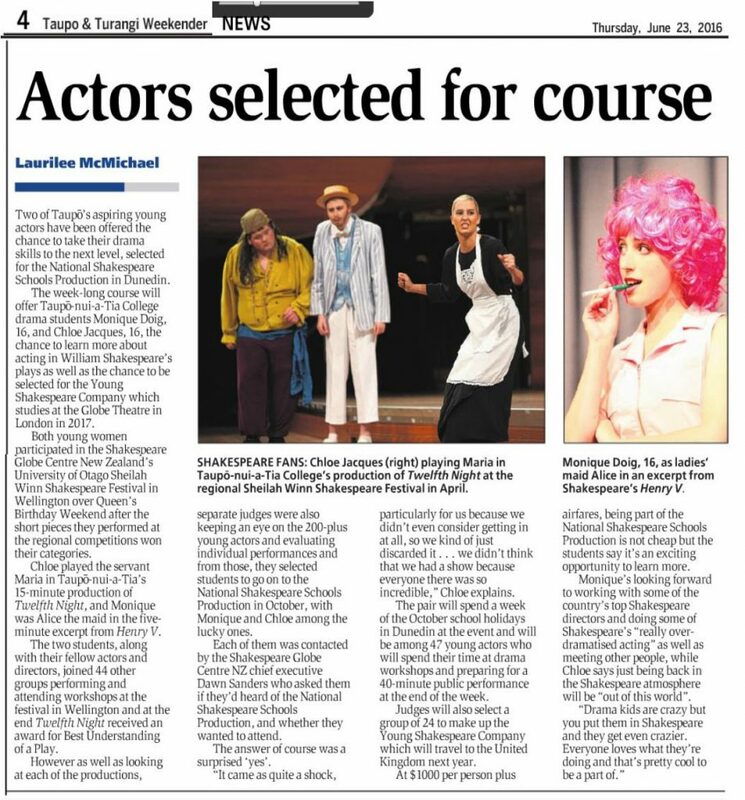 Smith and fellow actor and classmate Denva Graves had both performed in the Shelia Winn competition in Year 11 but found this time easier because of their growing confidence on the stage. “We didn’t do it for the competition we did it for the experience,” Graves said. 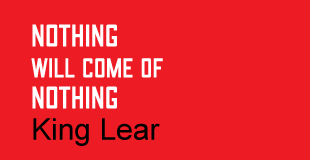 “There is almost a beauty of it, I like the rhythm and the learning of Shakespeare. 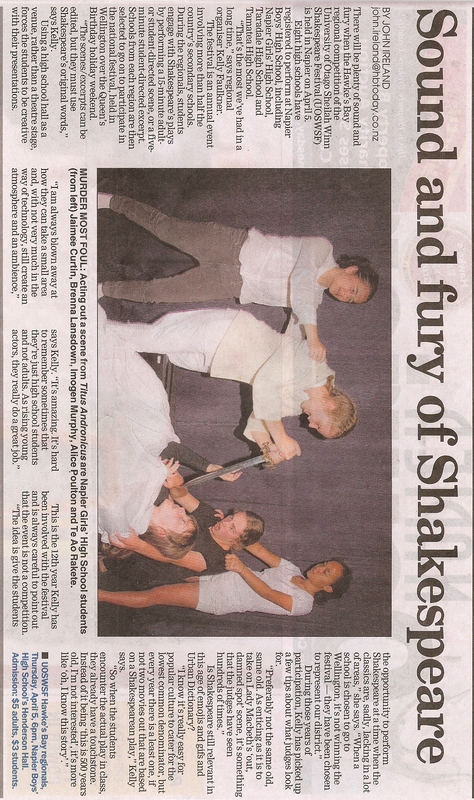 Blood, sweat, and glitter has gone into giving new life to Shakespeare, and Rotorua students will showcase their take on the classics for a chance to head to the Globe Theatre in London. 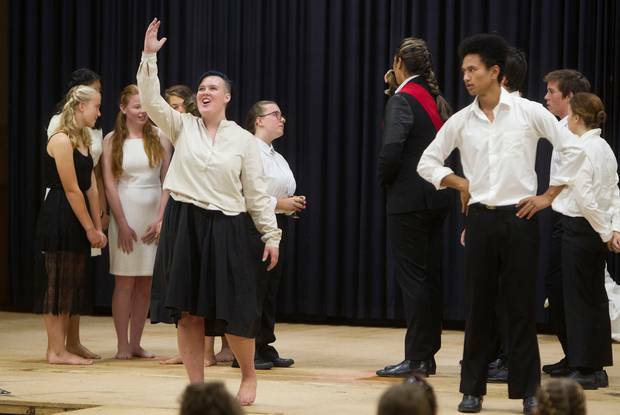 The 2019 University of Otago Sheilah Winn Shakespeare Rotorua Regional Festival will grace the stage at Rotorua Lakes High School this Saturday. The festival, in its 28th year, gives local students the chance to direct and perform in front of an adjudicator who selects the best performances to go on to the national festival. 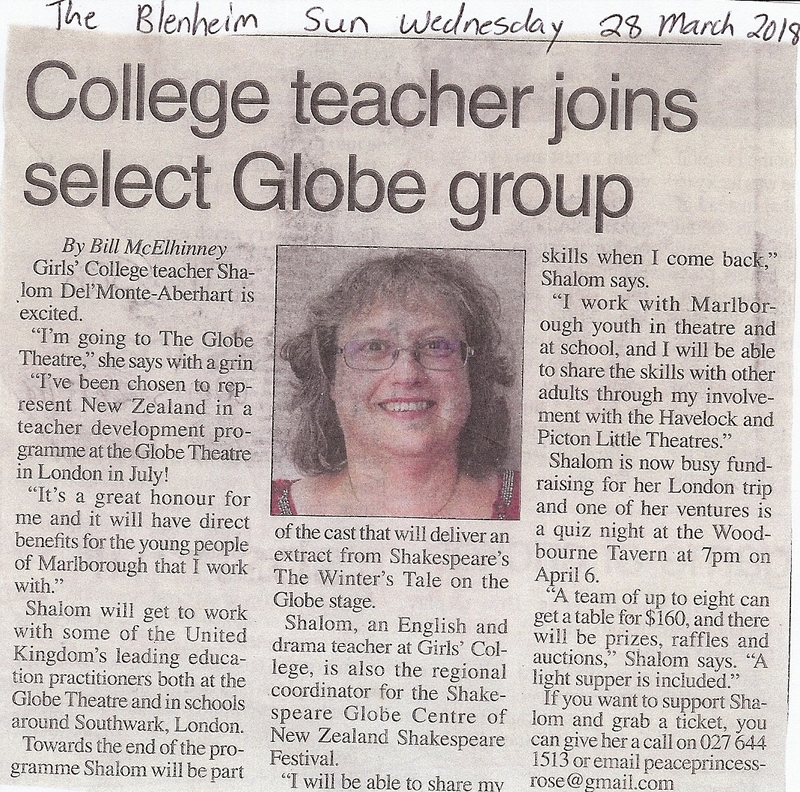 From there, students are in the running to go to the Globe Theatre in London. 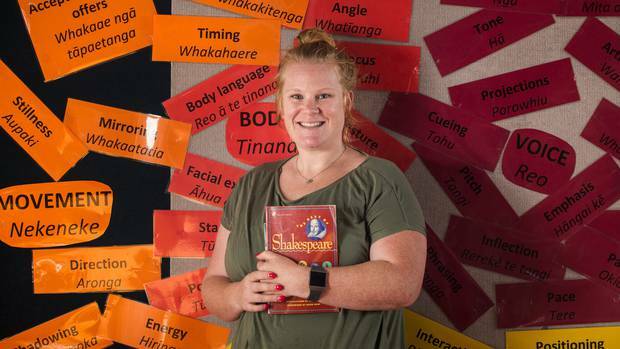 Local organiser Candice Stevenson had been organising the Rotorua regional festival for the past six years and said the students never failed to impress her. 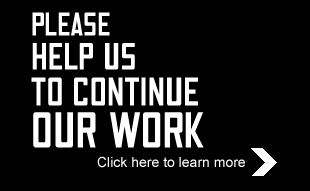 With only nine weeks for students to source and edit the scripts, hold auditions, and bring their idea to life, Stevenson said the feat was undeniable. “You wouldn’t think students would get geared up on Shakespeare,” she laughed. The competing groups this weekend are from Rotorua Girls’ High School, Western Heights High School, John Paul College, and it has also been extended this year to Katikati College. 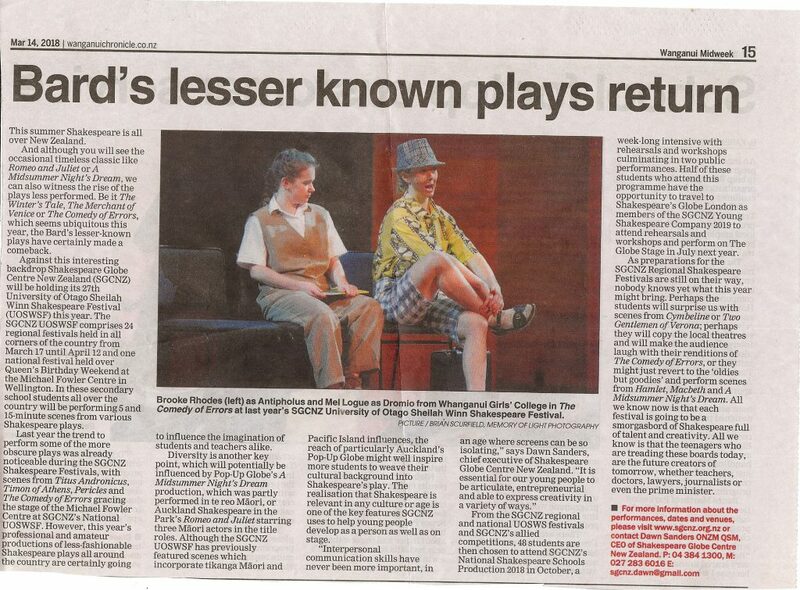 Performances will be either a student or teacher-directed scene which will be the director’s take on Shakespeare. One of the acts the audience can expect is a Hamlet and clown infusion, directed by Stevenson. Having been to the Globe in London when she was younger, she knew firsthand what could be gained personally and creatively from the exposure. She said students who attended the Wellington festival last year came back with a renewed passion and sparked creativity from seeing what others had done. “Because I’ve gone through it, I know what students can get out of it,” which is one of the reasons Stevenson always put her hand up to organise the festival in Rotorua. Students from Rotorua had previously made it to London which Stevenson said showed others it was possible to make it. 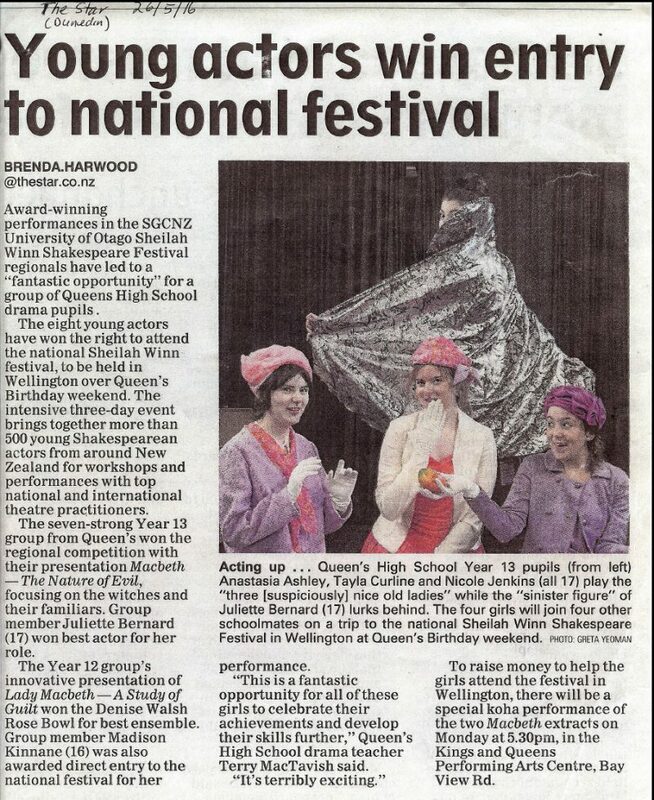 The national festival will be in Wellington on June 3 where 3000 students will perform for the 60 spots at the London Globe. “An expat Kiwi wants to make Wellington the first city to have a container replica of Shakespeare’s Globe Theatre in London – but the capital will have competition from Detroit. Angus Vail, who runs business management for rock acts such as Kiss in the United States, wants to bring the 60-container, $8.5 million semi-permanent structure to Wellington, providing a new 1200-seat venue and tourist drawcard. While other interpretations of the Globe – which is itself a replica – exist around the world, Vail said there was a need for a duplicate venue of similar dimensions and medieval feel outside London, so its players could tour. The moveable, modular structure built from 20ft shipping containers would have 600 box seats and standing room for another 600. It could be put on a vacant lot and become permanent or be moved later, he said. Vail is working with Shakespeare Globe Centre NZ founder Dawn Sanders, who said the theatre would fill a void in mid-size venues in the capital and could be used for all performing arts, from rock concerts to ballet. “It just seems like a no-brainer if we can get a developer and the council’s heads together,” Sanders said. She had approached a number of developers and had the backing of Shakespeare’s Globe, which was excited at the prospect. Shakespeare’s Globe chief executive Neil Constable has backed Vail’s idea and said the replica, or replicas, in whichever city they were set up would be a “huge asset to the world and to the Shakespeare family”, as it would allow its players to tour. A recent council-commissioned report recommended the council consider building a mid-sized venue, but with a focus on accessibility, affordability, and flexibility.